This post was written by Garrett Russell. We rely on our bodies to work. That's a no-brainer. Traveling on a budget often involves staying in a hostel, taking public transportation, and very commonly using your appendages to get from place to place. I have walked all over this planet, and I expect my body to continue accommodating my knack for physical exertion. But then I stepped on a nail. I thought I knew how to treat a wound. I've taken basic aid classes. I have a Bachelor's degree in Science. After stepping on the nail, I tried everything I knew possible to stop the impending infection. It probably didn’t help that I went swimming right afterward. I slapped a bandage on my foot and ran straight to the river. It was that hot. 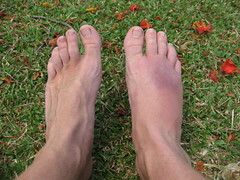 The next day, my foot was not in good shape. I took some medication, tried to bear the pain, and hoped my body would handle the seemingly minor issue. Of course, Fiji isn't suburban America. I could never fully get clean in the Highlands. The Fijians offered some interesting remedies, and even though I was skeptical, I gave them a try, for the sake of experiencing new methods. First, a boy named Cotu Cotu beat my foot with a stick to bleed out the wound - right after I removed the nail. Then Daiana, a woman of similar age to myself and Lindsay, placed my foot over a pot of boiling water with medicinal leaves. I gave in and allowed my foot to be scalded by steam for as long as possible. I was told to not walk on cement, because the wound would sense it and not heal. I was told to place as much pressure on the wound as I would normally, but as time went on, it was too painful to continue that route. Obviously, the Fijian way of life is very different from our American ways. In the Highlands, if something doesn't concern someone, they don't find out (aside from the widespread frequency of gossip). And asking doesn't help either, because if there is no need to know, why ask? No one found it necessary to tell us there was a dispensary in the village, even after we asked about the nearest clinics. It wasn't until our little friend, Samu, showed up with a bandage on his leg that we knew we weren't the only ones with health supplies. We have been in the village for a month and a half, and we just found out what was potentially the most valuable resource we could have asked for regarding the project's success. Vita managed the government-funded dispensary, meaning the government built a nice little house the size of an American bathroom and filled it with medical supplies we barely knew how to use. Having taken a few classes on first aid, Vita volunteered to be the one in charge, dedicated her time and her own money to make sure it was well-stocked and manned by someone savvy. Hobbling over to the dispensary, we introduced ourselves to Vita and asked for some medical attention. She turned out to be the coolest women we'd met in the village, and we decided to give her all of our medical resources in order to train children and adults to find her for first aid. The pain continued to escalate and was most bothersome when I tried to sleep. Not only was I sweating my you-know-what's off, but I was also fighting off mosquitos, lying on a hard floor, and trying to ignore the pulsing pain from my ever-swelling right foot. Question: What do you do when you don't feel well? I called her from the village phone, and with the use of Skype's awesome international rates, she gave me some comfort and valuable insight. I started taking Lindsay's antibiotics, but the bacteria traveled too deep into the soft tissue of my foot to be extracted. Since they didn't do the job 24 hours later, I had to go to Suva. As always, Mom knew best. I found it ironic that I was in a village to teach people how to stay healthy, and I was the one that got a serious infection. Luckily, I knew when it was time to seek medical help, even when the villagers told me I'd be okay. Being the most savvy medical personnel in the village at the time, it was a big wake up call to realize I was the only one who could help myself. The road to the village was still impassable over Namado, so at 5:30am, Lindsay and I walked the longest, darkest, most painful kilometer of my life. Wearing Crocs and using the side of my foot, I hobbled as fast as I could to reach the carrier on time. We parked in Suva at 10:30am, and the carrier was bound for the village three hours later. We booked it to the Suva Private Hospital. With Lindsay on my arm, we flew via taxi to the medical center and, within twenty minutes, saw a doctor. Medications were prescribed, and for less then $25 USD, I was free to go - with one exception. The doctor asked me to stay in Suva for at least three days to make sure the infection did not spread or worsen. Jackie was expected in three days, and Lindsay wanted to make sure everything was set in the village and that classes continued. For the first time on our trip, Lindsay and I parted ways. I found the South Seas Hotel for $7 USD a night. Though lacking in most creature comforts, I was happy to have the small bed and ceiling fan. I slept a lot. The infection completely wiped me out. I rested up, let myself heal, and prepare for our final month in the village and the arrival of Jackie, our first Nakavika Project participant. After almost two days, I could walk with a small limp, which allowed me to explore the capital city. I took in the epic cinematic masterpiece of Avatar - an interesting contrast to rural village life. After those two days, I missed Lindsay, my foot improved - thanks to some Ciprofloxacin - and I was mobile enough to surprise our guest a day early at The Uprising. What would you do if your trip was interrupted by an injury? Do you have the knowledge to take care of yourself or your travel companion? Here are a few tips that will help you prepare in case of an emergency. Travel Insurance. GET IT. Not only is it extensive, but it's reasonably priced. I recommend World Nomads. Be prepared. Know about the necessary immunizations for every destination but also think about bacterial infections. You may have a cut that never heals because of bacteria in the air, water, dirt, or inside your body. This is caused by poor hygiene (sometimes you can't help it), unclean water, and food. Bring enough or always have handy some sunscreen, aloe, band aids, antibacterial ointment, Pepto-Bismol, Immodium, and pain relievers. Water purification tablets aren't a bad idea either, and it's best to bring them from home to avoid the search abroad. Don't forget to hydrate! Drink water...'nuff said. Bring some supplements. I eat a terrible diet on a budget. In Europe, I went through one country on bread and Nutella. Notify the U.S. Embassy that you will be visiting their country. This will bring you up-to-date information about the country and provide valuable information in case of emergencies. Learn through IAMAT where the best and nearest traveler-friendly hospitals are in your destination countries. Have you had a similar occurrence on the road? A bad health problem you had to figure out or brave traditional remedies to try and fix? Share this post if you found it interesting or helpful, and comment your experiences/opinions below!